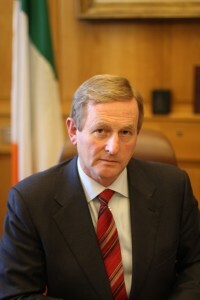 Enda is a good Taoiseach. He could be a great one. To quite grasp what sort of Taoiseach Enda Kenny is, cast your mind back to the last chaotic weeks of the last Fianna Fail government. Remember cabinet ministers not actually knowing if the country was about to surrender its economic sovereignty. Remember members of the parliamentary party actually hiding in toilets or turning off their phones to avoid being appointed to the cabinet weeks before polling day. Remember the questions about drink in the middle of the greatest economic crisis we had ever faced? Then we got Enda, and calmness, and a bit of dignity restored, and, it has to be said, a sense that the new crowd at least had a plan. That the bailout and the budget deficit would be rationally worked through, and that employment would be the number one priority. And it was, and is, and slowly there’s a sense that things are picking up and the dust is clearing. If Enda stepped down tomorrow, he’d step down as the most successful leader of Fine Gael ever (Enda!) and a Taoiseach who quietly surprised us all in steering us through the worst of the storm. And yet he could be so much more. Remember when political reform was bandied around in 2011? The New Politics, all that? Say that to people inside the bubble and you get the sneer. “Political reform? Yeah, that’s all they talk about on the canvass in Ringsend or Athenry.” It’s true, they don’t. Nobody talks about getting serious about electoral reform or separating the executive from the legislature on the doorstep. But here’s the thing. In 2007 I’ll bet they didn’t talk about banking regulation either, and the same class of fella in the bubble did nothing about that either, and crippled our country as a result. They may not be talking about political reform in the pubs across the country. They’re not talking about medical device safety standards either, or air traffic control, or the proper control on the sale of pharmaceuticals. But let a pacemaker fail because of shoddy standards and you’ll discover that the public assumed that the minister for health was doing his job. Just because it’s not being talked about on Joe Duffy doesn’t mean it doesn’t matter. He’s giving the economic issues plenty of attention, and they have to be his priority. These are people lives, and they are the things he’ll be measured on, and rightly so. But the big picture, the political infrastructure that makes it all work, or in the case of the last government, takes us to the brink? All that stuff matters, yet it seems to have nothing to do with him, as if someone else will think the big thoughts. Well, there is no one else. There’s Enda, and this is the difference between a legacy as that nice fella from Mayo who tidied up after that crowd, and the Taoiseach who actually grasped the big picture and the importance of not just fixing the problems, but making sure they don’t happen again. We’re looking for the next Lemass, and people sometimes forget that Lemass is revered today not for his day to day, but for the two big ideas that radically changed the status quo: industrialisation and Europe. It’s time for Enda to think big.